The herbarium accepts gifts as determined appropriate by the Curator. All material becomes the property of the herbarium. The herbarium does not maintain private collections. All specimens must be collected and imported legally and in accordance with Fairchild Tropical Botanic Garden's Policy on the Convention on Biodiversity. Include a copy of each of the permits for our files. All specimens must be dried according to standard herbarium practice. Air drying is preferable when possible. The herbarium accepts some other types of specimens as well (pickled, Silica dried for DNA etc. ), if they are accompanied by standard vouchers. Collections may be of mounted specimens, or unmounted specimens in single sheets of folded newspapers. 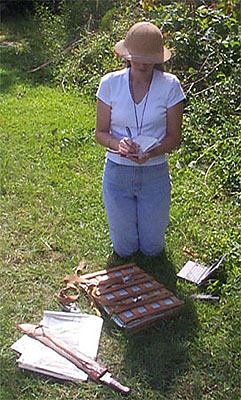 Label(s) must be included with each specimen. Include an official letter of transmittal from the collector stating the number of specimens and the range of collection numbers. The label data should also be provided to the herbarium in an electronic database (MS Access) or spreadsheet. Photos copyright © 1999 Virtual Herbarium. 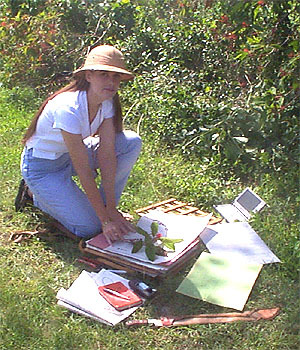 Herbarium specimens are the vouchers that document identity and occurrences of taxa. They remain in museum collections for hundreds of years and are repeatedly studied so it is important that they be well collected and well documented. 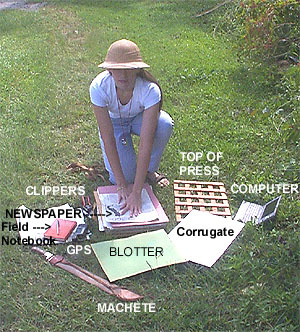 Specimens should be provided to the herbarium pressed flat and fully dried in a single piece of folded newspaper (approximately 28 X 40 cm when folded). To press a specimen put it in a folded piece of newspaper and then put that between two cardboard corrugates (pieces of corrugated cardboard cut with the flutes going from side to side). There are also metal corrugates available if you will be collecting in wet areas or require exceptional durability (but they are expensive). If you can put the press over forced air or a low heat source and are collecting relatively low biomass specimens, then just using cardboard usually works fine. The idea is to dry the specimens to a stable state without them getting moldy, however, too much heat will burn them or make them too brittle. Also, using heat degrades DNA. Specimens that have been air dried without heat can often donate useable DNA many years after collection. Special specimens for DNA analysis and preserved specimens can also be collected if appropriate. If you are collecting particularly wet or fleshy material, you should also place a piece of thick blotter paper between the cardboard and the newspaper. These blotters can be changed daily if there is no forced air or heat available. If you are using cardboard corrugates, paper towels make reasonable blotters as well but are more difficult to manipulate. Blotters must be used if you intend to use metal corrugates, otherwise, your specimens will look like an accordion. Presses and other supplies are available for loan from the herbarium. A very good press can be constructed from two pieces of 1/2" plywood. Hardwood and aluminum models are also available. In addition to purpose built straps, luggage straps work well — even rope can be used to secure a press — however, we have found that ratcheting compression straps made for tying down loads on cars work very well if weight is not crucial. A good specimen will include all parts of the plant reasonably necessary to fully reconstruct at least the herbaceous parts in the mind, based only on the specimen. This means that you must collect the entire plant for herbs or a complete set of leaves and a piece of bark for trees. There are special methods of collection for some groups such as palms and bamboos. With extremely rare exceptions (e.g. bamboos) specimens MUST have either fruit or flowers (or both) to be acceptable. When pressing a specimen, remember that it will eventually be mounted on a sheet of paper with one side glued down, thus turn a leaf over when pressing (and other parts that may be different on opposite sides) so that both sides can be seen on the final specimen. All specimens should be clearly marked with a collection number. We recommend starting with "1" and maintaining a sequential list for life. NEVER use the same number twice. Collectors should keep a field notebook in pencil or indelible ink. If you are on an extended field trip, we recommend having your fieldbook photocopied periodically. 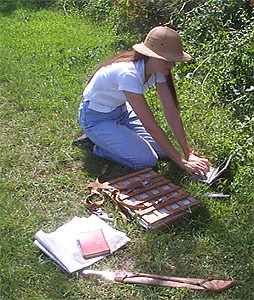 Some researchers also enter their collection data into a computer at the time of collection; others wait until later and transcribe the data from their field notebook. Specimens are worthless without the collection data. Every specimen number should be listed in the field notebook along with the appropriate collection data which will eventually go on the specimen's label. Print on archival acid free paper of 24 lb - 28 lb weight. Use at least 10 pt type. Use a clear typeface such as New Century Schoolbook, Garamond, Palatino, or Times New Roman. Width may be up to 4 ¼ inches wide (half of 8½ x 11 inch paper). Length can be from 3” up depending on the complexity of plant descriptions, location, habitat, project description, permits, funding, etc. Labels should NOT have pictures, maps or borders around or behind the text. If you include a map place it above the label, separate from the text. Sabal palmetto (Walt.) Lodd. ex Schult. Habitat A detailed description of the habitat including the type of vegetation, the community, list neighboring plants in the community and the local variation, e.g. flooded, west facing mangrove dominated by old growth Rhizophora with a closed canopy app. 3 m high, with Coccoloba uvifera, Hibiscus tiliaceus, Terminalia catappa, Cocos nucifera. Physical description A detailed description of the plant, especially of characteristics that will not be obvious from the dried specimen (e.g. flower color, odor, bark, height, habit). Also include some estimation of the size of the population and the plants’ frequency in the area as this information can be used to assess conservation status. Latitude, longitude, elevation of the collection (or UTM). GPS units are available for loan for staff and associates from the herbarium. Collector (you) and others in the collecting party. List all with you when you made the collection. Although you may be collecting as a group, each individual in the group should maintain individual collection numbers for their own collections. Collection number continuing in chronological order starting with your first collection consecutively to the most recent. Permit number(s) If a permit or several permits are required — they almost always are — you need to have the permit number(s) clearly indicated on the label. Remember that multiple permits are often required. Specimens will not be accepted if they were collected illegally or if the permit numbers are not indicated on the label. Name of project collecting for. Name of grant(s) and funding source(s). Often the funding source, grantors, and project title are included in the footer, centered in smaller font, at the bottom of the label. Chase, M.W. and H.H. Hills. 1991. Silica gel: An ideal material for field preservation of leaf samples for DNA studies.